To read a call number, consider each section independently. Books and journals are arranged on our shelves according to the Library of Congress (LC) classification system. 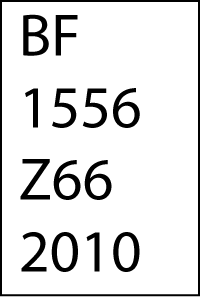 These call numbers uniquely identify and organize items near other material on the same or similar subjects. TK defines the class and subclass, or broad subject area. Within Class T for technology, for example, TK represents the subclass electrical engineering. 7881.6, is the classification number, which defines the subject matter more finely. M29, is the Cutter number and usually indicates author, though may also represent further subject subdivision or geographic area. Sometimes there are double Cutters: TK 7700 M29 A35 1990, for example. 1993 is the year of publication. Not all call numbers will include the year of publication, but most recent books will. These file in chronological order and often distinguish among varying editions of a text. Find specific call number locations in our libraries by consulting the maps below.